I can tell it’s Dracourage, my 2013 Chevrolet Cruze. There was a light dusting of snow Saturday night. But that’s not anything that looks like a “light dusting” today. Urgh. Maybe I can wait it out. The snow will melt. Spring is coming soon. And then I receive an alert on my cell phone. I get these alerts from the Town and Village of Green Island, it’s their way to let me know of any issues in the Town and Village that might require my attention. Ah, nertz. If I don’t get Dracourage out of that snowbank, the Town and Village might do it for me – at my cost. Okay. Chuck’s gotta do what Chuck’s gotta do. I layered up – sweater, lined jacket, insulated gloves, a stocking cap – and prepared to battle the snowbank. As I left my home, I saw at least four other people trying to dig their cars out of their own personal snowbanks. One person had a portable snow blower and had carved a nice little path around his car. A second person used his own personal horse power and shoveled his way out. A third person dug enough of a path for him to climb into the car and try to rock his way in and out of the snowbank. I think he’s still stuck there, because I could smell the burning tires as they strained to et a grip in the flowing snow. I gotta take this carefully. I first dug a path in front of Dracourage, then on the side. I wiped down the hood, roof, windshield and side windows. Then I cleared that snow away. Then I went back to my house. Look, I’m 55 years old, I gotta be careful about over-exertion. All right… More shoveling. More digging. Dig dig dig. Okay. Now let’s see what the power of General Motors has for me. I climbed in and started the car. Okay. I’m not stuck, I just have to break out of this spot like the Kool-Aid Man going through a wall. Forward one more time … and …. Okay. Dracourage is out of the snowbank. God bless General Motors powertrain power. I nursed my chilly chariot for a few blocks, navigating it to the parking ot of the old Ford Motor Company radiator plant. The Town and Village uses that plant for emergency parking in snow storms, and the lot already had enough cars to start a used car dealership. I’ll park here. We’re good. Now I have to trudge the five blocks home. 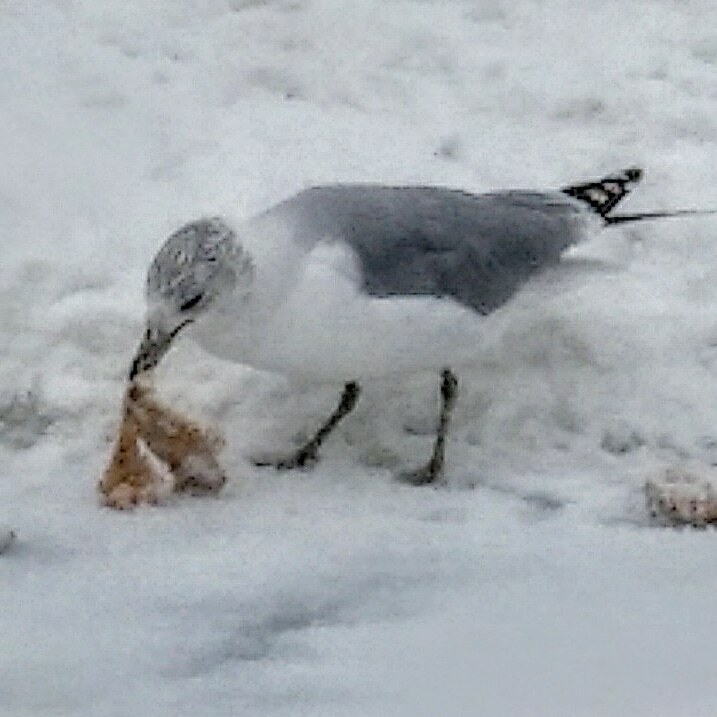 And on my way home, I saw what looked like a seagull as he rummaged for food. It’s snowing like the final season of Game of Thrones and this birdie’s looking for Sunday brunch. If nothing else, I at least avoided the mandatory towing of stuck cars during the snow emergency. This is a good thing. My car will be safe at the Ford lot. Other than that … I’m fine. But yeah, if you ever get stuck in a situation like that … take your time digging out. Don’t overdo it. Dress warmly and in layers. Don’t lift more than you should – small shovelfuls of snow are better than big hernia-inducing mounds of snow. And clear off as much of your windshield, hood and roof as you can. If you don’t, the first time you stop, you’ll have all the snow from your roof fall in front of your windshield. 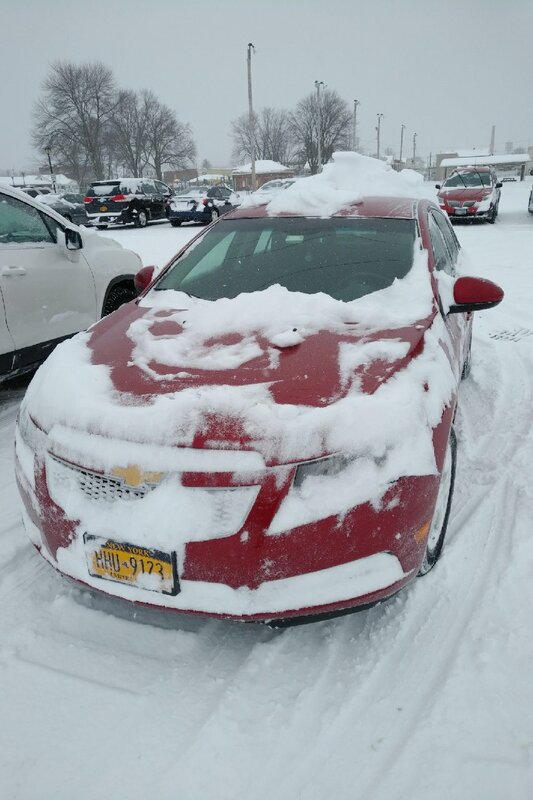 If you go past 30 miles per hour, all that snow will fly from your hood into your windshield. And if you don’t believe me, watch the highway as clowns who barely clear a porthole-sized portion of their vehicle’s windshield still attempt to speed along the interstate, leaving show-filled contrails behind them like ground-based skywriting trails. For me, the hard part is over. Now the next part begins – waiting for Mother Nature to warm up a bit. 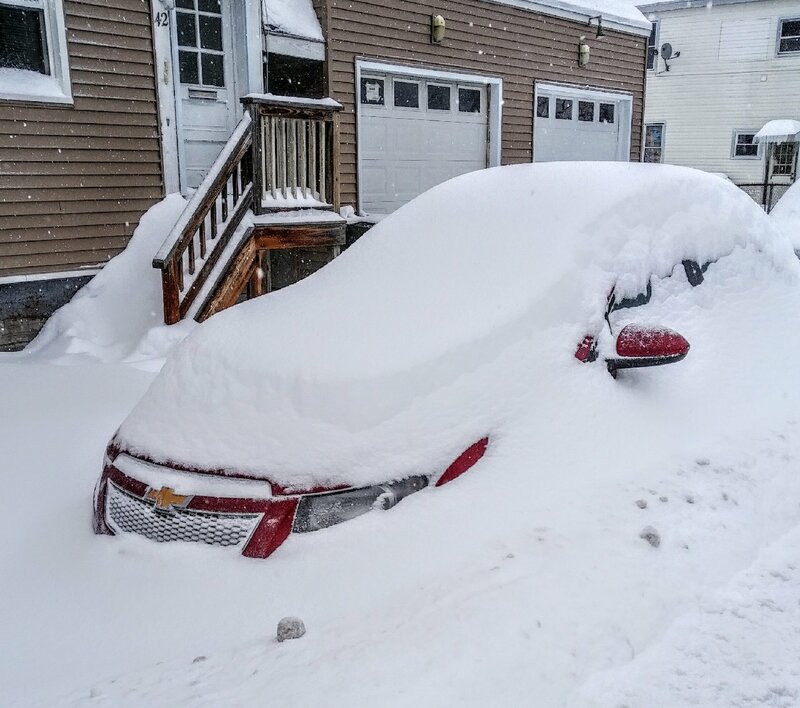 We came back from a funeral yesterday – we went by bus – and came home at 6:15 pm and THEN dug out the car. Brutal. I feel your pain. My first winter not parking in a covered state garage. It’s not fun at 61 cleaning off all that snow, and trying to manuever to a safe spot. But I did it, even after getting stuck in a snowbank. Good luck to us for the rest of the winter. Or, just enlist one of those fine young people roaming Green Island looking to earn a few honest dollars by shoveling snow. Oh, sorry — I closed my eyes and it was 1979 for a moment. I’ll add the Minnesota way: clean your car off 3x a day during the winter. Shovel walks and or driveway 2x a day. Just accept that there will always be weather beyond our control. Last spring, it snowed 52 hrs in a row. I was thinking like you and hired my little neighbors to haul sleds full of snow out of the tight spots. Like my alley. They made $15 and moved 30 loads. I didn’t have to throw snow over a 6ft fence. That’s my win! Oddly, we end up hanging out more with neighbors after bad weather. Everyone is dealing with it, someone offers cocoa, then cookies, then someone starts a huge bowl of chili, soup etc.